Asus has the 5Z (premium), the 5 (middler) and so they neeed the 'economical' version. Something for the folsks that just wouldn't know the difference at all. For the price I'm sure it's still a good zinger (and we don't know the pricing just yet), but this model loses the AI capabilities of its peers. So, it's still an 18:9 and a 1080 screen, so still good! Just drop down to the SD 630 processor, but you're still getting 4GB of RAM without AI cameras, still some good Sony sensors. But dual cameras in both front and back (which the others only have duals in the back). Barcelona, Spain and Fremont, CA (February 27, 2018) — ASUS today announced the ZenFone 5Q (introduced onstage at MWC as the ZenFone 5 Lite, but available in the North America as the ZenFone 5Q), a stylish 6-inch smartphone featuring a premium true four-camera system with fully independent high-resolution and wide-angle cameras at both front and rear. The ZenFone 5Q is the perfect choice for true photo lovers who want to stand out from the crowd. The ZenFone 5Q removes the limits on photographic creativity, with a high-resolution main camera — 20MP at the front, 16MP at the rear — and, uniquely, a secondary 120° wide-angle camera at both front and rear. Unlike rival systems, each camera works independently for perfect shots, every time. Powered by the Qualcomm® Snapdragon™ 630 Mobile Platform, the ZenFone 5Q combines incredible performance and a 3300mAh battery with advanced security and convenience features — including NFC, rapid face unlock, fingerprint recognition and dual SIMs — for a complete mobile experience. Designed for true photo lovers, the ZenFone 5Q features a premium true four-camera system with four fully-functional and independent cameras. Each main high-resolution camera — 20MP Sony at the front and 16MP at the rear — is accompanied by a secondary wide-angle camera with a 120° field of view that's wider than a standard lens, giving users the best of all possible worlds. Unlike other systems where the secondary camera only works in conjunction with the main camera for special effects, in the ZenFone 5Q, each of the four cameras can be used individually, removing the limits on creativity and giving users the freedom to tailor their shots to the occasion. With a choice of standard or ultrawide shots at both front and rear, the ZenFone 5Q makes it easier to compose the perfect selfie group selfie (wefie), landscape, portrait or group shot. 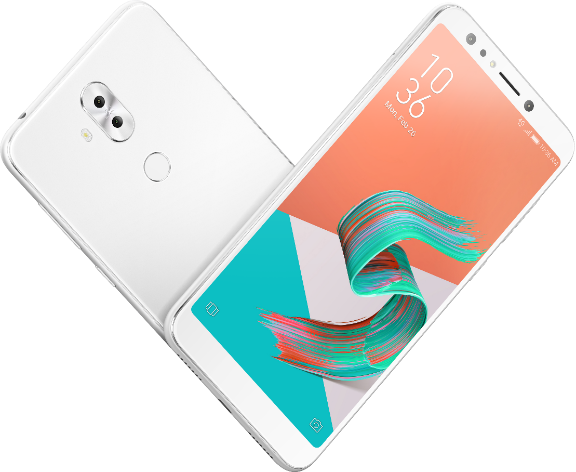 The ZenFone 5Q includes the ASUS BeautyLive live-beautification technology with live-streaming video support for Facebook, YouTube, Twitter, Instagram and other social media platforms. Users can choose from a range of enhancements — such as removing skin blemishes or adjusting skin tones — in real time, and they can use the handy Mirroring mode to avoid annoying mirror-image videos with unreadable text. Beautification is enhanced with the softlight LED flash, giving perfect skin tones in photos or when streaming in low-light conditions. The ZenFone 5 Lite has a stunning 6-inch screen, but it’s as compact as most 5.5-inch smartphones. That’s because it uses our latest edge-to-edge Full View display, featuring an 18:9 aspect ratio and ultraslim bezel. This beautiful Full HD+ (2160x1080) display has superb color accuracy — essential for photo lovers — and the wide format delivers a bigger view of everything. With full support for new 18:9 features like YouTube’s ‘zoom-to-fill’, videos and movies have never looked better, and the extra-wide display is perfect for using dual side-by-side windows in landscape orientation, or stacking multiple windows in portrait orientation. The ZenFone 5Q is powered by the Qualcomm Snapdragon 630 Mobile Platform for dramatically faster CPU and GPU performance. And for blazingly fast network connectivity in any situation, the ZenFone 5Q supports up to 400Mbps 4G LTE download speeds, up to 75Mbps uploads, and 802.11ac dual-band Wi-Fi. The optimized power efficiency of the 14nm Snapdragon 630 Mobile Platform's FinFET Low Power Plus power-saving technology combined with a 3300mAh battery gives users up to 24 days of 4G standby time, 30 hours of 3G talk time, or 4 days of music playback usage. The ZenFone 5Q also incorporates NFC technology for convenient and secure mobile contactless payments with Google Pay™. For flexible, fast and easy access, the ZenFone 5Q includes rapid face-unlock technology that's ideal for unlocking the phone when hands are cold, wet or messy. It quickly unlocks the phone and can also prevent unauthorized users from viewing lock-screen notifications. There's also a handy rear-mounted fingerprint sensor that instantly unlocks the phone in just 0.3 seconds. For the ultimate on-the-go convenience, the ZenFone 5Q has a triple-slot tray with two SIM slots — supporting speeds up to 400Mbps — plus a microSD slot for expanding storage by up to 2TB. The ZenFone 5Q is crafted to perfection, with 2.5D-contoured glass panels at front and rear that simply ooze luxury. Its appearance is enhanced with an optical coating to give it a deep sheen and stunning color. PixelMaster camera modes: Auto (with night HDR and portrait), Beauty, Selfie Panorama, GIF Animation, 8 various filters. PixelMaster camera modes: Auto (with night HDR and portrait), Beauty, Pro (up to 32 seconds long exposure), Super Resolution (65 megapixels), GIF Animation, Panorama, Time Lapse (with power saving), 8 various filters.